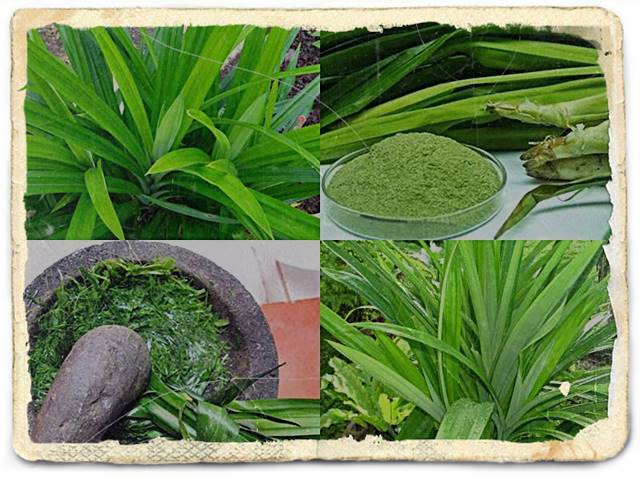 Benefits of Pandanus Leaves Healthyt1ps.com - 9 Benefits of Pandan Leaves for Health and Beauty and Side Effects. Now more food uses pandan leaves as a food flavoring. It is undeniable that pandan leaves have a distinctive fragrant aroma, so it is often used as a mixture in making cakes, or serving foods such as compote, ice dawet, or sweet porridge. Even sweet martabak starts using pandan leaves as a base for the dough. Just imagine it can make you hungry Besides being able to make food more enjoyable, fragrant pandanus leaves also have many benefits, both for health and beauty. Traditional natural medicine using pandan leaves is one of the health secrets left by our ancestors. 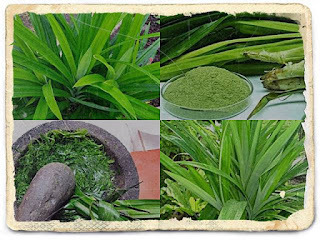 In Indonesia alone, many people have believed in the efficacy of pandanus leaves, and some of them are: the benefits of pandan leaves to miss v, cholesterol, face, skin, and hair. The Latin name for fragrant pandanus leaves is pandanus ammaryllifolius. High Blood Because of the reasons for being busy working, many people don't care too much about health. If you often feel prolonged dizziness, be careful, it could be a symptom of hypertension or high blood pressure. Moreover, coupled with an unhealthy diet, such as excessive salt consumption, might worsen this condition. If left unchecked, hypertension can cause stroke, heart attack, and kidney disorders. For this reason, if there are signs of hypertension, it should be addressed immediately. You only need to boil two pieces of pandan leaves with two cups of water, let it boil until there is one glass left. Drink twice a day until your blood pressure returns to normal. In addition to reducing high blood pressure, consuming fragrant pandan leaves will reduce cholesterol levels in the body. Adding Appetite In certain conditions, a person may lose appetite. In fact, every day the body needs nutrition from food. If it is not fulfilled, the functions of the organs can be disrupted. To restore appetite, you can make fragrant pandan leaf tea. The method is to boil the pandan leaves with water. After boiling, pour boiled water of pandan leaves into a glass, then add honey or sugar to taste. Delicious, warm pandan tea will immediately restore your appetite. In addition to increasing appetite, the fragrance of pandan leaf decoction tea is very tempting. Rheumatism As a result of fatigue, a person often experiences aches or pains in the knee. In fact, there are also those who experience swelling in the joints. It is a sign that someone has arthritis. Pandan leaves are efficacious to reduce pain in rheumatoid sufferers. The trick, prepare 3 pieces of pandan leaves, then thinly slice. Then, boil the slices with hot coconut oil. Stir until the leaves wilt and cool. After that, apply the mixture to the painful part of the body. Insomnia Have you ever had trouble sleeping at night, even though tomorrow you have to leave early in the morning? Insomnia is indeed very disturbing. Usually, insomnia occurs when the mind is not calm. Then, when you suffer from insomnia, have you ever tried drinking fragrant pandan tea? Pandan leaves contain alkaloid compounds that can provide a sedative effect on the body. When experiencing insomnia, pandan leaves can help you calm down and make you easy to sleep. The trick, boil the pandan leaves with hot water, then add one teaspoon of honey. Drink when it's still warm. Panu The presence of tinea versicolor can cause a disturbed appearance. The reason is, phlegm is a fungal infection characterized by white patches on the skin. Not only interfere with appearance, phlegm can also make it uncomfortable due to the itching that is caused. To overcome phlegm, you need to first smooth the pandan leaves. After that, squeeze the water, then give enough salt. Drink once a day for three days. If the phlegm is gone, you will regain confidence. Colds and fever The fever usually signals that the body is fighting infection. People with fever will experience an increase in body temperature, causing discomfort. To reduce fever, you can drink steeping water from pandanus leaves. After that, your body heat will immediately drop slowly. Stomach cramps Abdominal cramps can occur due to digestive problems or infections in the stomach. To overcome this, you need to cut the pandan leaves into small sizes, then boil until boiling. After that, strain and drink the water while still warm. Cancer We don't realize, carelessly consuming food can cause the body to store harmful poisons. Drinking pandan leaf tea can help the body get rid of these poisons. In addition, fragrant pandan tea also inhibits carcinogens which are the main cause of cancer. Dandruff Hair Dandruff often makes us uncomfortable because it makes itchy on the scalp. I want it to be scratched, but later it can hurt. If it's not scratched, it's not strong enough to resist itching on the head. Of course, the most appropriate solution is to eliminate the dandruff. With pandan leaves, you can eliminate all the annoying dandruff in the head. The trick, mash 10 pieces of pandanus leaves until smooth, then add a little water. Then, apply the mixture to all parts of the hair. You can do this activity before shampooing. As a result, your hair will be free of dandruff and itching. Hair Loss Long hair loss can cause baldness. To overcome this, you can pound the pandan leaves, then rub them evenly on the head area. After that, rinse thoroughly. Do these activities every morning. The roots of your hair will become strong and not easily fall out again. Although sometimes it grows wild, fragrant pandan leaves have many benefits. Not only beneficial in the culinary field, pandan leaves are also efficacious to overcome various diseases. The efficacy of drinking boiled water of pandan leaves is very much, and amazingly, there are no side effects of fragrant pandan leaves for the human body. The price of fragrant pandan leaves is also quite cheap, which is 4,000 Rupiah per 200 grams or 1 bunch. Enough with pandan leaves, you don't need to bother buying expensive medicines. So, what are you waiting for? Thus article 10 Benefits of Pandan Leaves for Health and Beauty from Healthyt1ps.com. If Sayanda's friends have questions about article 10 Benefits of Pandanus Leaves for Health and Beauty; do not hesitate to ask.